Alexis Bledel was recently a guest on Late Night with Seth Meyers. During her appearance, she revealed she's going to be a regular character on the second season of The Handmaid's Tale. Her nonverbal displays during this moment are analyzed below. SETH MEYERS (continuing at 2:45): "And this is really exciting, we were talking back stage - you are going to be a season regular for season two which is great." 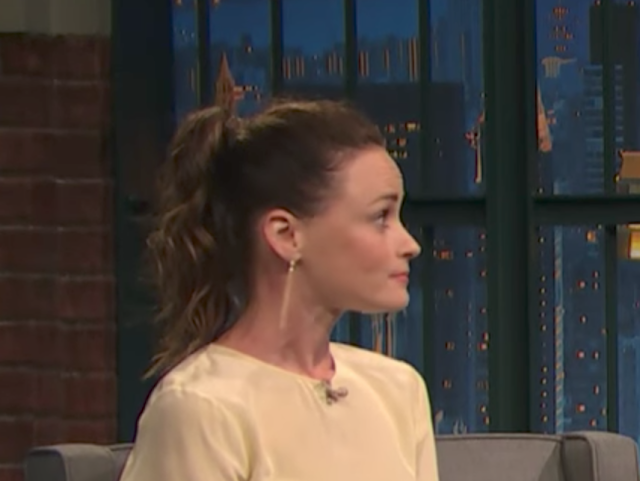 ALEXIS BLEDEL (over-talking): "Yes - I'm so excited." SETH MEYERS: "And - it's especially, ah, great, b-, but not only because I was so invested in your character, but a lot of characters on this show don't - they're not going to make it to season two." 2:51 - Just after she says, "... I'm so excited", Alexis Bledel displays a classic and strong expression cluster. The corners of her mouth vector laterally (not upward) which signals the emotion of regret. This expression is amplified by her jaw jutting, chin dimpling, and the elevation of her central forehead. 2:52 - Alexis briefly looks down to her right. This is the quadrant to which we look when we're experiencing significant sadness and/or regret. 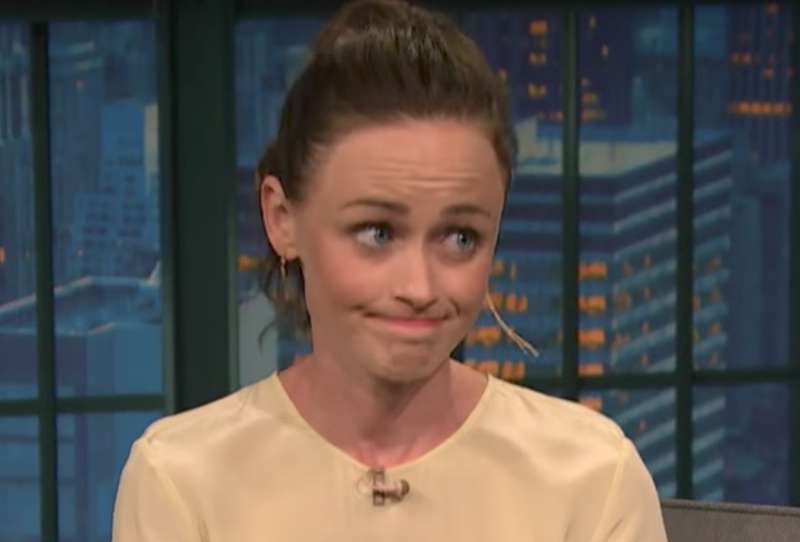 2:53 - Ms. Bledel displays a second strong mouth component expression of regret. This is a microexpression and our view immediately cuts to another camera. 2:54 - Alexis bites her lower lip - which is an indication she's trying to suppress her strong emotions. Additionally, this is one method our psyche use in an attempt to re-establish a more contextual emotional baseline. She also is opening her upper eyelids open very wide. This is a signal of an adrenaline surge. 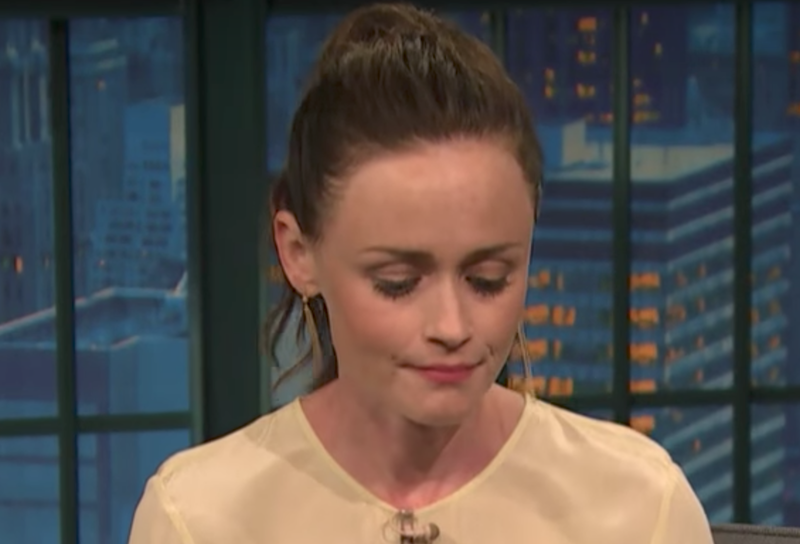 Alexis Bledel realizes her negative feelings are probably detectable - and she very much doesn't want to show her cards. 2:55 - Here we see dramatic mid-facial tension, jaw clenching, and nostril flaring. These are further signals a high adrenaline moment. This is immediately followed by a hard swallow (2:56), which does not capture well on a still photo, and is a nonspecific signal of anxiety. 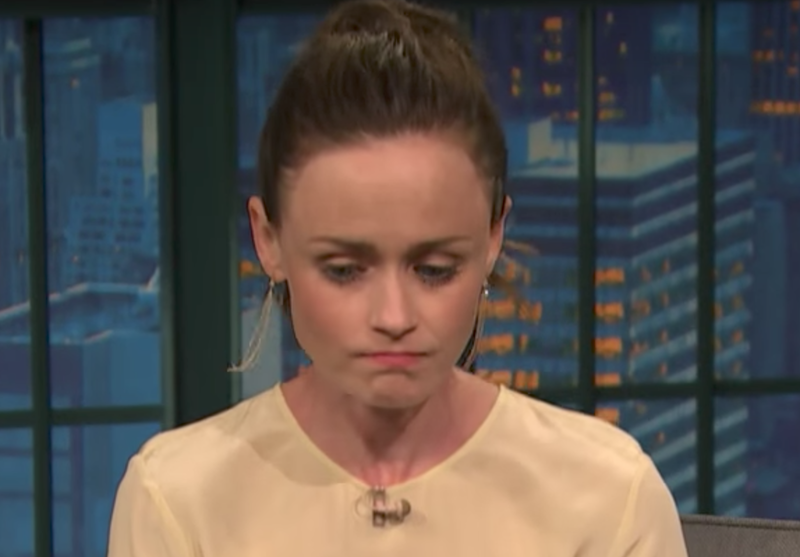 Summary: Alexis Bledel has strong feelings of regret and sadness about being a regular in the second season of The Handmaid's Tale. We have insufficient information to say exactly why she feels this way. Despite the fact that she's a very accomplished actor, when Alexis is not "in character" - and just being herself, she is no better at acting than anyone else. This display of body language, of course, is not just limited to her - and it's a fantastic example of how emotions "leak out" in all of us. Do you think Seth Meyers sensed his guest's regret, sadness, and anxiety? What other important nonverbal signals does Ms. Bledel display? Body Language Analysis No. 3979: Ivanka Trump, "I Try to Stay Out of Politics"
Nonverbal Communication Analysis No. 3862: Oscars Mistake - "La La Land" erroneously named Best Picture over "Moonlight"